Start the meal off with zucchini soup and crushed pistachios. 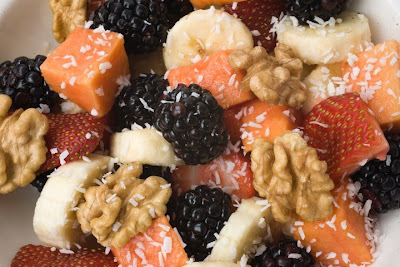 Select your favorite fruits, berries and nuts. Top with coconut. Serve ingredients for veggie wraps with ginger-tahini sauce. Save room for raw chocolate almond macaroons. Although the weather across the country has been anything but spring-like lately, Easter traditions typically involve bright colored food and clothing, like dyed eggs and flowered hats! So it's quite appropriate to have a colorful raw brunch filled with a rainbow of fruits and vegetables. For the first course, serve a light, creamy Raw Zucchini Soup with Crushed Pistachios. If you are serving family style, double the recipe and serve the soup in a 2 quart bowl with the crushed pistachios in a small bowl next to it. Put out tea cups which are just the right size for a small, first course serving. If you want to serve Raw Crackers with the soup, you will have to make them a day in advance since they take 16 hours to dehydrate. Is There Anything Prettier than a Colorful Fruit Salad? 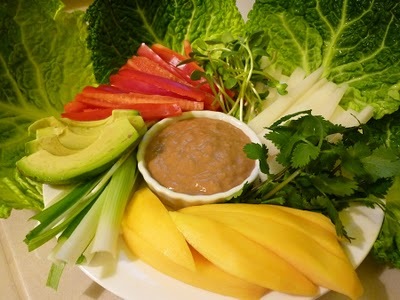 Fill cabbage, collard greens or butter lettuce with an assortment of veggies and fruits like daikon, avocado, mango, red bell pepper and sprouts as in my recipe for Raw Veggie Wraps with Ginger Tahini Dipping Sauce. With a big meal like this, save a little room for these bite sized Raw Chocolate Almond Macaroons. Remember to make them the day before as they take 8 to 12 hours to dehydrate. Double the recipe because these will fly off the plate. Whether you are celebrating Easter, Passover or just the beginning of a new season, I hope you and your family enjoy this colorful and healthful raw menu. 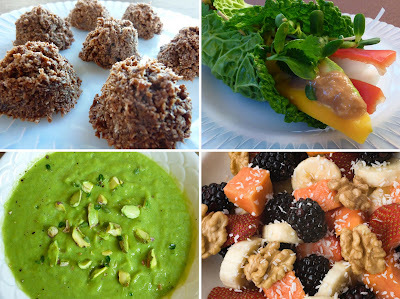 For other raw menu ideas, check out A Complete Raw Thanksgiving or Winter Holiday Menu or A Complete Raw Hanukkah, Christmas or New Years Menu. Turmeric is the spice that gives curry its gold color and contains the phytochemical compound, curcumin. It has been used as a powerful medicine in China and India for centuries. Turmeric has strong anti-inflammatory properties with no side effects. Although it has been used for numerous ailments from toothaches to rheumatoid arthritis, there has been some exciting research linking turmeric to the prevention of Alzheimer's disease and the ability to inhibit the development of many cancers including pancreatic, colon, prostate, liver, esophageal, and others. I'm very excited by these findings and started using more and more of this lovely and healthful spice. Here's an easy and delicious raw soup recipe that includes turmeric. In a VitaMix or other high speed blender, process zucchini, peas, celery, avocado, water, lemon juice, garlic, salt, thyme, turmeric and pepper until smooth. Pour into 4 bowls and top each with 1 tablespoon of crushed pistachios, fresh thyme and additional fresh ground pepper, if desired. Per serving: 163.6 calories, 9.0 g fat, 1.2 g saturated fat, 0 mg cholesterol, 7.0 g protein, 17.7 g carbohydrates and 6.6 g of fiber. Process almonds in a food processor. Add salt and raw cacao or cocoa and process until blended. Blend in agave nectar, almond extract and coconut butter. 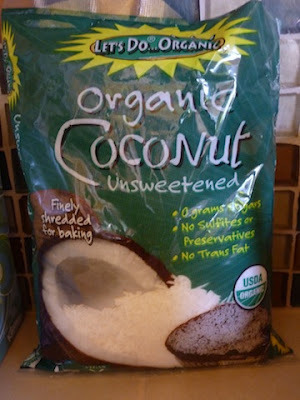 Add shredded coconut and pulse until combined. Scoop macaroons onto a Teflex sheet and dehydrate. Macaroons are my husbands favorite cookie. Whenever we go to "Slice of LIfe, our favorite vegetarian restaurant where we live in Sebastopol, Doug always buys one of their chocolate dipped macaroons on the way out and savors it all the way home. While making almond milk for my last posting, I took the residiue almond pulp, threw in some coconut and stevia and dehydrated it to see what would happen. Unfortunately the result tasted like saw dust so I kept experimenting until I had much better results. The next time I started with soaked almonds instead of pulp (although I think pulp would work, I just didn't have any more), some cocoa for intensity, agave nectar for sweetness and a touch of salt. They looked great but I dehydrated them too long and they were so hard you could break a tooth while trying to eat one. In round three I added some almond extract for an even more interesting flavor and a little coconut butter to keep the cookies from drying out. This finally resulted in a delicious macaroon that received Doug's seal of approval! 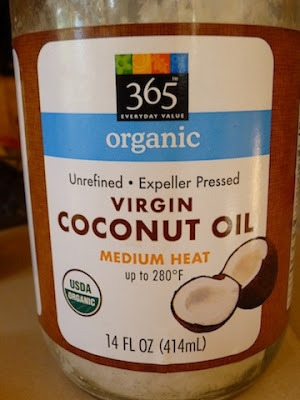 I am not yet ready to jump into the debate over tropical oils. On one hand, you've got a contingent that believes that tropical oils (coconut and palm oils) can help you lose weight , build energy and help you fight disease. On the other side of the argument you have those who focus on their high content of saturated fat which conventional wisdom tells you to avoid. Personally, I don't avoid tropical oils but I eat them sparingly. I will continue to watch for data that proves the many health claims made about them before I voice a strong opinion. In any case, enjoy this recipe as a "holiday treat", not a health food to consume in large quantities every day. Macaroons are a popular Passover dessert since they are made without flour. But the Easter bunny could enjoy these just as much! Process almonds in a food processor until they are the size of crumbs. Add salt and cocoa and process again until combined. Add agave nectar, almond extract and coconut oil and process until smooth. Add shredded coconut and pulse to combine. 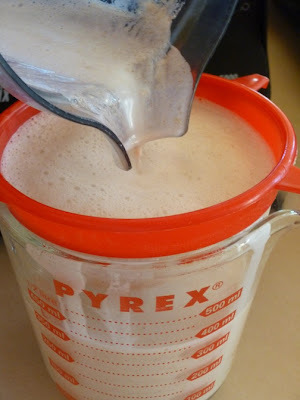 Scoop out scant tablespoons of the mixture onto a Teflex dehyrator sheet using a melon baller or small ice cream scoop. You could also just use a tablespoon. In about 4 hours, when they are easily removed from the Teflex sheet, transfer the macaroons directly on the dehydrator screen. Dehydrate at 115 degrees until they are hardened on the outside but still soft and chewy on the inside. This could take as little as 8 hours total or if you want them a little drier, dehydrate for a few more hours. Just pop one in your mouth while dehydrating until you like the consistency. Hopefully there will be some left by the time they are done! Per macaroon: 81.2 calories, 5.8 g fat, 3.5 g saturated fat, 0 mg cholesterol, 1.2 g protein, 7.1 g carbohydrates and 1.3 g of fiber. Soaked almonds being blended in a VitaMix. Strain through a fine, mesh strainer. 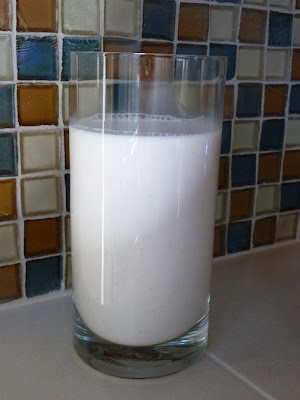 Nutritious Almond Milk - No Need to Run Out to the Store! How convenient not to have to run out to the store to buy milk! All you need is a few almonds and a VitaMix or other high speed blender and you have fresh nut milk. If you want truly "raw" almond milk, you will have to buy the almonds at a farmer's market or directly from the grower as most almonds you get at the supermarket are blanched. For those of you who consume cow's milk, give nut milk a try. It's less mucous forming which is especially important during allergy or cold and flu season. It's also a good alternative for those who are lactose intolerant. In my doctoral research I concluded that adequate calcium is difficult, but not impossible, to get from a strict raw food diet. If you have a fairly alkaline diet and avoid foods that bind calcium, you may not need as much calcium as others who don't. There is a lot of misinformation about calcium, thanks to the dairy industry and their large marketing budget. The two things they want you to believe are: one, you need lots of it and two, the best way to get it is with dairy products. Calcium is the most abundant mineral in the body. It is important for bone and tooth development as well as muscle contractions and nerve transmissions. In 1989, the National Academy of Science recommended 800 mg of calcium for adults over 25. In 1994, the NIH raised this amount to 1,000 mg for premenopausal women 25-50 and 1,500 mg for postmenopausal women not taking estrogen drugs. That's a lot of calcium. Do we all really need that much? Well, that depends. Like many nutritional guidelines, I do not believe that "one size fits all". I do believe that the amount of calcium you need depends on your overall diet. Some foods cause the body to deplete calcium and others bind usable calcium reducing its bio-availability. If you eat a diet rich in these foods, you may need to take as much as the NIH recommends. Oxalic acid foods such as spinach, chard, beet greens, cocoa, turnip and mustard greens can bind with calcium. But before you stop eating these healthful, nutrient rich foods, consider the opinion of Dr. Norman Walker. According to Dr. Walker, famous for his raw juice therapies, oxalic acid, when found in raw foods and in its "organic" state, is beneficial and essential to good health. It is only when these foods are cooked that oxalic acid combines with calcium and destroys its nutritional benefit and forms painful "inorganic" crystals in the kidneys. Although I could not verify his theory, Dr. Walker lived until 99 so I feel he's a pretty credible source. According to him, oxalic acid from raw food may not reduce your amount of calcium. Phytates, found in nuts, beans and grains, are another detractor and can bind calcium, zinc, iron and other minerals. According to Paul Pitchford, the author of "Healing with Whole Foods", soaking and sprouting these foods will reduce phytic acid and make calcium and other minerals more bio-available. Raw foodists and others who do not soak and sprout nuts, beans and grains will have reduced bio-availability of the calcium they consume and will therefore require higher amounts. Many raw food recipes, however, call for the soaking and rinsing of these high phytate foods so if you are diligent about this, it should not be a problem. Acid forming foods such as red meat, poultry, fish, eggs, pasteurized dairy, sugar, coffee, alcohol, pasta and some beans, nuts and seeds cause the body to draw calcium from the bones to neutralize the acid. Raw foodists avoid meat and dairy but consume quite a few grains, nuts and seeds, some of which are acidic. Dr. Gabriel Cousens, in his book, "Conscious Eating", states that sprouting of all nuts, seeds, beans and grains cause them to become more alkaline. This would certainly reduce the amount of calcium the body needs to use to neutralize acidic foods. Given the difficulty of getting adequate calcium with a raw food diet, it is very important for raw foodists to soak and sprout acidic nuts, seeds, beans and grains. Here's one website listing alkaline and acidic foods . Milk, Does It "Do a Body Good?" Because of their acidic nature, I believe that dairy foods may not be the best source of calcium despite the popular slogan, "milk, it does a body good!". In 1986, Hedsted's study (as sited in Campbell and Campbell's book, "The China Study"), reported that the rate of hip fractures is higher in countries where the consumption of cow's milk is high where those countries with the lowest consumption of cow's milk have the lowest incidence of hip fractures. He sited that the U.S. drinks the most cow milk and has the most hip fractures! On the other hand, there have been several studies that have shown a positive link between the consumption of fruit and vegetables and bone health which may be attributed to their alkalizing nature. Raw food vegans who soak and sprout all acidic nuts, seeds, beans and grains and eat lots of alkaline fruits and vegetables may not require as high an amount of calcium as those who eat foods with the above mentioned detractors. With that said, it is still difficult to get even half the recommended requirement of calcium on a raw food diet. Two tablespoons of raw tahini provides 126 mg of calcium and a cup of kale only provides 90.5 mg, and these are two of the most calcium dense raw vegan foods. Although I don't personally aim for the standard RDA of calcium, I do supplement with a few hundred mg of calcium per day (see below). If you feel you are not getting adequate calcium, you may want to take calcium supplements. I always take magnesium with my calcium to make it more absorbable (either 50% to 100% as much magnesium as calcium depending on your needs). So when I make raw nut milk, or smoothies, I often throw in a complex of 250 mg of calcium citrate and 125 mg of magnesium citrate with some vitamin D per cup of liquid. If your calcium complex comes in a capsule, break open the capsule and empty the contents in the blender. If it is a hard pill, drop it in the blender with the water and let it sit for a few minutes to dissolve. Voila, you have your very own "fortified" milk. A single brazil nut provides 137% of your daily requirement of selenium, a powerful antioxidant that fights free radicals. I always keep brazil nuts on hand a drop one or two into my nut milks or smoothies. Serve nut milk with raw or baked granola or other cereals or as the base in any smoothie . You can also use it as a replacement for hemp milk in Chia Seed Pudding . Just add some vanilla to the almond milk and follow the rest of the recipe. Rinse almonds and brazil nuts and put in a VitaMix or other high speed blender with filtered water, stevia and calcium supplement. If calcium is in a capsule, break open and put contents in the blender. If it is in pill form, drop it in the water and let it sit for a few minutes until it starts to dissolve. Blend for 1 to 2 minutes until the nuts are fully processed and the mixture is white, like milk. Strain nut milk once or twice in a fine, mesh strainer. For a purer milk, put a few layers of cheesecloth over the strainer. Save the residue to make raw crackers or cookies. Since the amount of residue is dependent on your blender, I cannot provide exact nutritional information on the resulting milk. But 1/4 cup of almonds provide nearly half the RDA of vitamin E and 21% of the RDA of vitamin B2 (riboflavin). Adequate amounts of both of these vitamins are difficult to achieve on a raw food diet so drink raw almond milk, it really does a body good! Doug making his famous banana bread. 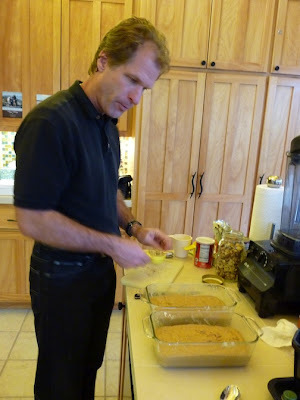 For those of you know our family, you know that my husband Doug is famous for his delicious banana bread. When the kids come home, it's the first thing they ask for. Our old neighbors used to leave ripe bananas at our front door as a hint they wanted a loaf of his banana bread. What is great is that it's pretty healthy too. It's made with white whole wheat flour, so you get the fiber and nutrition of whole grain flour with a light and delicate texture. Doug also uses organic, cage free, omega 3 eggs that provide 225 mg of omega 3 fatty acid per egg. The recipe has much less oil and sugar than traditional recipes and the walnuts also provide a good helping of omega 3. And of course, dark chocolate is full of flavonoids and antioxidants and has been associated with improving cardiovascular health, lowering blood pressure, lowering LDL cholesterol and uplifting your mood when eaten in moderation. Feel free to make this recipe with just walnuts or just chocolate chips or make it with both. Some people are allergic to nuts so you can delete them. Or, if you are making this for breakfast, you may want to leave out the chocolate chips. I think the bread is great with any combination so make it to your taste. * If you cannot find white whole wheat use half all purpose white flour and half whole wheat. Grease a 8.5" x 4.5" pan and preheat the oven to 350 degrees F.
In a bowl, beat together (with a hand mixer) oil, sugar, apple sauce and vanilla. Mix in mashed bananas. Add eggs and beat lightly until combined. Add flour, baking powder, baking soda and sea salt and beat until combined. Stir in walnuts or chocolate chips (or both). Pour the batter into the prepared pan and bake for 55 to 60 minutes or until a toothpick comes out clean when inserted in the center of the loaf. When done, remove from oven and let cool in the pan for 10 to 15 minutes. Carefully cut around the edges of the pan with a knife and turn over to remove the loaf from the pan. Put on a cooling rack for another 15 minutes. (We usually can't wait that long but it's a lot easier to cut when you wait). Slice and serve. Per serving (English walnuts only): 186 calories, 7.4 g fat, 1.1 g saturated fat, 35.8 mg cholesterol, 4.2 g protein, 25.9 g carbohydrates, 2.8 g fiber and 306 mg omega 3 fatty acid. Per serving (chocolate chips only): 181.8 calories, 6.5 g fat, 1.3 g saturated fat, 35.8 mg cholesterol, 4.0 g protein, 27.3 g carbohydrates, 2.8 g fiber. Per serving (both English walnuts and chocolate chips): 197.8 calories, 8.1 g fat, 1.5 g saturated fat, 35.8 mg cholesterol, 4.4 g protein, 27.6 g carbohydrates, 2.9 g fiber and 306 mg omega 3 fatty acid. Papaya seeds look and taste like black pepper. My husband and I absolutely love papaya. Whenever we travel to a warm place like Hawaii or Mexico, the first thing we look for are papayas. Their sweet, buttery taste is unique and although we would love to restrict our shopping to local produce, this is a case where it's worth making an exception. Hawaii papayas are pear shaped, about 7 inches long, have orange flesh and weigh about a pound. Mexican papayas can be much larger and can weigh up to ten pounds or more. Because of the size, the flavor of the Mexican papaya is a bit less intense than the papayas from Hawaii but I think both of them are wonderful! 1. Papaya contains the digestive enzymes, papain and chymopapain that aid in the digestion of protein. 2. Because of its high antioxidant content (vitamin C, E and beta-carotene) and its enzymes, papaya helps reduce inflammation, lower the risk of heart disease and and may help reduce symptoms of arthritis. 3. Papaya seeds are edible and look and taste like black peppercorns. 4. Rich in lycopene, papaya consumption may help lower the risk of prostate cancer. 5. Papayas is associated with latex-fruit allergy syndrome so if you have an allergy to latex, you may be allergic to papaya. (Ditto for avocado and banana). 6. Ripe papaya has been used as a topical remedy against ringworm. 7. Unripe papaya can cause uterine contractions and should not be eaten in early pregnancy. Green papaya has been used as a folk remedy to prevent pregnancy. 8. Papaya seeds are said to reduce male fertility and are used as a folk remedy as birth control (don't count on it!). 9. Some papayas can grow as long as 20 inches! 10. Christoper Columbus called papaya "the fruit of the angels". Pop one in your mouth and notice the peppery taste of the seeds. When blended in a VitaMix, the seeds look like specks of black pepper! 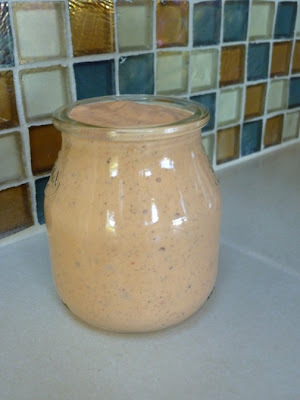 Adding the papaya and strawberries, the dressing has the look and consistency of a thousand islands dressing. If you want larger "chunks" of black pepper, add the seeds at the end with the olive oil. Clean and prepare all salad ingredients and place them in a salad bowl and set aside. Place all salad dressing ingredients except the oil, in a high speed blender. Blend until smooth. Add olive oil and blend briefly until combined. This makes one cup of dressing. Toss desired amount into salad and serve. Per serving of salad: 85.8 calories, 5.3 g fat, 0.8 g saturated fat, 0 mg cholesterol, 1.6 g protein, 9.8 g carbohydrates and 4.9 g of fiber. Per tablespoon of dressing: 34.1 calories, 3.4 g fat, 0.5 g saturated fat, 0 mg cholesterol, 0.1 g protein, 0.8 g carbohydrates and 0.2 g of fiber. Vegan granola with soy milk and mixed berries. An easy way to chop nuts. Drizzle and stir liquid ingredients into the oat mixture. Bake oat mixture in a roasting pan at low temperature. Mix granola with fruit and yogurt for a healthful breakfast. Mix in a few chocolate chips and serve on dairy free ice cream. It amazes me how expensive it is to buy cereal and my husband can polish off an entire box of it in a few days! Then, of course, there is the worry of what is in the ingredients. To get around these issues, I've decided to make my own cereal. A friend visited last week and shared her granola recipe with me. I modified it a bit to add more omega 3 fatty acids by adding ground flax seed, hemp seed and walnuts. I also replaced the honey with agave nectar and stevia for those vegans who do not include honey in their diets. I also added a touch of tahini just for fun. Except for the fact that I can't get it to clump very well, it is very delicious. (I did read somewhere that granola clumps better if you use "quick" oats but I haven't verified that yet). I've been in a granola mood all week and also developed a raw granola recipe which I posted on Tuesday so be sure to check out Raw Granola - The Health Benefits of Nuts and Seeds. Many of the nutrients and health benefits written about in that posting apply to this recipe. Although this recipe is not raw, many of the nutrients and fatty acids are preserved by starting out with raw nuts and seeds and baking at a very low temperature. OK, I admit, I got a bit carried away with all of the ingredients. As mentioned in the Raw Granola posting, every nut and seed has a unique nutritional benefit so not to miss out on any, I included many different types of nuts and seeds in this recipe. Besides flavor and packing in the vitamins and minerals, I also strived for optimizing the omega 3 to omega 6 ratio which is critical for vegans. See Best Fish and Vegetarian Sources of Omega 3 Fatty Acids. But if you want to simplify and only use a few nuts and seeds, just increase the amount of the ones you do use to get the same volume. I've made quite a few cups of granola this week trying to perfect this recipe so of course we've been eating it in many different ways. For breakfast, my favorites have been with raspberries and blueberries and unsweetened Silk soy milk. Another favorite was with a sliced banana and yogurt. I didn't particularly love the soy yogurt I used but once it was mixed with the yogurt and banana, it tasted pretty good. I bought several other non-dairy yogurts the other day which I will eat and review with you shortly. If you are not lactose intolerant or a vegan, try using goat yogurt. It's more digestible than cow's milk and goat farms are generally less "corporate" and the animals are treated more humanely. My husband also enjoyed the granola with a few chocolate chips mixed in and poured over a bowl of soy ice cream. Yummmm! Preheat oven to 250 degrees F and get out a large roasting pan. Add oats, wheat germ, walnuts, pistachios, pecans, cashews, almonds, sunflower seeds, pumpkin seeds, hemp seeds, flaxseeds, cinnamon, sea salt and stevia into a large bowl and combine. [An easy way to break up pistachios or other large nuts is to put them in a zip lock freezer bag and hit them gently with a wooden mallet until they reach the desired consistency. Or buy nut "pieces" which are also less expensive]. In a small bowl, mix tahini, agave nectar, oil, and vanilla. Drizzle the wet mixture into the dry oat mixture and stir very well until the oats are well coated. Spread out into a roasting pan and bake for 50 minutes or until golden. Don't over bake.Clean out the large bowl, you will be using it again. Remove pan from the oven and scoop the baked granola into the large bowl to cool. Once cooled, mix in the coconut and dried fruit. When completely cooled, put into air tight containers and store in a cool place. Serve with fresh berries and soy milk or with fresh fruit and yogurt. It's also delicious as a topping for ice cream with a few chocolate chips mixed in. Per half cup serving: 215.4 calories, 16.9 g fat, 3.2 g saturated fat, 0 mg cholesterol, 4.1 g protein, 14.7 g carbohydrates, 2.5 g fiber, 793 mg omega 3 and 4,287 mg omega 6 fatty acids. Raw Granola - Hearty Breakfast And Convenient Snack. Also, The Health Benefits Of Nuts And Seeds. Soak nuts for 4 hours, seeds for 2 hours and dates for 30 minutes. After soaking, rinse nuts and seeds. Lay out mixture on a Teflex sheet and dehydrate. Once dehydrated, break up into bite-sized pieces. Store in air tight containers and refrigerate for freshness. Manganese: Important in the metabolism of carbohydrates and amino acids. Supports bone health, blood sugar balance and energy production. Copper: Needed in the metabolism of iron, the formation of red blood cells and keeping a healthy immune system. Magnesium: Plays a key role in the proper functioning of muscles and nerves and supports energy production. Phosphorus: Key in the formation of bones and teeth, energy production, protein synthesis and muscle contraction. Thiamin: Required for carbohydrate metabolism and supports the nervous system. Omega 6 fatty acids: Required for cholesterol metabolism, growth and reproduction. English Walnuts: High in omega 3 fatty acids with a good balance of omega 6 fatty acids. Omega 3 is key for proper functioning of all body tissues and is especially needed in fetal development. It reduces inflammation and is important for heart health and brain development. Pistachio nuts: High in vitamin B6, needed for amino acid metabolism and proper functioning of the nervous and muscular system. Sunflower seeds: Contain high levels of vitamin E and selenium, both strong antioxidants that work together to protect our cell membranes. Sunflower seeds are also high in vitamin B6, folate, niacin, zinc and iron. Vitamin E, zinc and iron are difficult to get in a raw food diet so sunflower seeds are an important food for raw foodists. Iron is needed for the formation of hemoglobin and transporting oxygen. Zinc supports growth, immunity, sexual development, detoxification and wound healing. Pumpkin seeds: Also high in iron and zinc, pumpkins seeds are important in a raw food diet. Flaxseeds: Very high in omega 3 fatty acids. Tahini or sesame paste: High in calcium, needed for bone and tooth development as well as muscle contraction and nerve transmission. Calcium is also difficult to get in a raw food diet so sesame tahini is an important food for raw foodists. Hempseeds: Hempseeds are high in omega 3 fatty acids, zinc and iron and are a very important food in a raw food diet. Whether or not you are on a raw food diet, raw granola makes a great snack, especially for the kids. Just throw some in a baggy and drop it in their lunch boxes or take some to work for yourself. Don't get put off by the number of ingredients as each nut and seed offers unique benefits. But if you want to leave out pecans, just use more walnuts or cashews. Or double the sunflower seeds and leave out the pumpkin seeds. Get creative and use the nuts and seeds that you and your family like the best. This recipe was formulated to give a healthy balance of omega 3 and omega 6 fatty acids and provide some of the nutrients that are difficult to get in a raw food vegan diet. Also check out my Agave Sweetened Vegan "Cooked" Granola recipe. To minimize the use of bowls, I usually soak the nuts (walnuts, pistachios, pecans and cashews) for 2 hours and then add the sunflower and pumpkin seeds to the same bowl and soak another 2 hours. After soaking, rinse and drain the nuts and seeds in a strainer. Put them in a food processor and pulse 3 or 4 times until broken up to your liking. You may want to do this in two batches so the nuts and seeds don't get over processed. Once pulsed, place in a large bowl. Add wheat germ, un-soaked hempseeds and ground flaxseeds to the bowl and combine with the processed nuts and seeds. Stir in coconut and cranberries (or raisins). Without cleaning the food processor, add chopped apples, soaked dates, lemon juice, tahini, agave nector (or maple syrup), vanilla, cinnamon and salt and process until smooth. Pour into the bowl and stir into the nut mixture until thoroughly combined. Spread out onto 2 or 3 Teflex sheets and dehydrate for 8 to 12 hours at 115 degrees F. Flip over onto mesh tray, remove Teflex sheets and dehydrate for another 8 to 12 hours or until dry and crisp to your liking. When complete, remove from dehydrator and let cool. When cool, break up into small pieces and store until needed in an air tight container. Refrigerated, it will last for a few weeks. Serve with berries and raw nut milk or juice or just eat by itself for a snack. Per 1/2 cup serving: 248 calories, 16.1 g fat, 2.6 g saturated fat, 0 mg cholesterol, 5.7 g protein, 24 g carbohydrates, 3.9 g fiber, 1.2 g omega 3 and 6.3 g omega 6 fatty acids.